Hopefully, this will be the first of many. I have recently started a survey on hotels, resorts, inns and pension houses in Bohol with the hope of getting more personalized information from them regarding their places. First to respond is Bob of Alambung Tropical Living located in Panglao. His responses clearly exemplify the kind of hospitality they offer. The place is named after their Lumbungs, traditional native Balinese rice barns which they have constructed with Filipino touch. The place is located in Danao, Panglao Bohol, and within five-minute walk to the sea and a two-minute ride to the famous Alona Beach. 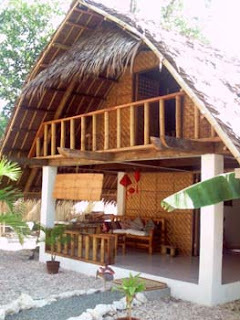 For inquiries, visit their website at www.alumbungbohol.com or email info@alumbungbohol.com. What's your place like? We have 2 villas and 1 cottage only, a small private place perfect for relaxing in a beautiful tropical garden. What are the accommodation options and how affordable are the rates? Villa rate for 2 persons is 1700 Php starting February 1st, 1500 Php until then. For extra person, the rate is 300 PHP for maximum of 5 in a villa. Cottage rate for 2 persons is 1200 PHP starting February 1st, 1000 PHP until then. What kind of activities can we do there? We are more on accommodation only, although we also arrange tours and island hopping, and have bikes for rent and can arrange motorbike rental. What are your amenities? Our villas are fully furnished with kitchen, you can barbecue as well. We are more on relaxation. What sets your place apart from the others? Comments from our guests: private, clean, tastefully arranged and decorated, quiet, romantic, away from the hustle and bustle. How do we get in touch with you and book? Through our website at www.alumbungbohol.com. Who is your manager/caretaker there? Me, Bob, the owner. Why do you think should tourists visit Bohol? Everything is here: beaches, history, coutryside, flaura... and then, if guests need to go to a city, there is also Tagbilaran. hi. ok man tagbilaran bay. gakaanam ug kabusy but still very laid back compared to metro manila or cebu. :) by the way, you have a nice blog. i am adding you to our blogroll. thanks for visiting. hi, i was reading the comments about bohol. I was amazed sa nyo description bout the place.. i am planning to vist there on june. Hi Guys! Im looking for coffee shop here in Bohol to have my On Job Training cos I just had my barista course in Manila. Im now in Cortes with my sister. Anyone here knows a coffee shop where i can have my OJT? It's an online broadcast of DYRD-AM. I like the post about Anda beach. I hope I can go there sometime this year... if my schedule lets up. a few questions here i wasn't able to answer. better late than never. good to place in panglao? lots of choices. check out the sidebar. coffee bar for ojt? you can try the one's in island city mall. of if you want something different,why not garden cafe, a resto which have deaf mute waiters. as to dyrd? yes, id love it on my blog. id study how. thanks.